Archeologist Emma Zale sees the past when she touches ancient relics. It's how she uncovered evidence of an ancient order of assassins -- the Sicari. When a sinfully dark stranger shows up on her Chicago doorstep demanding an ancient artifact she doesn't have, he drags her into a world where telekinesis and empaths are the norm. Now someone wants her dead, and her only hope of survival is an assassin who's every bit as dangerous to her body as he is to her heart. Ares DeLuca comes from an ancient Roman bloodline of telekinetic assassins. 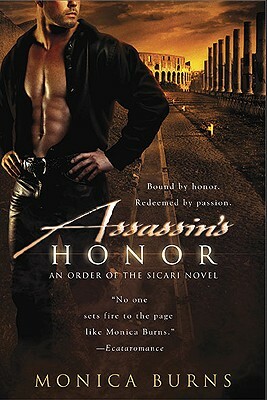 A Sicari, he's honor bound to kill only in the name of justice. But when the woman he loved was murdered, Ares broke the Sicari code and used his sword for revenge. Love cost him dearly once before, and he's not willing to pay the price again. At least not until hot, sweet, delectable Emma walked into his life. Not only does she hold the key to a valuable Sicari relic, she might just hold the key to his heart.